Do you want users to submit events to a calendar on your website? It can be a great time saver when you let your community help organize the events. 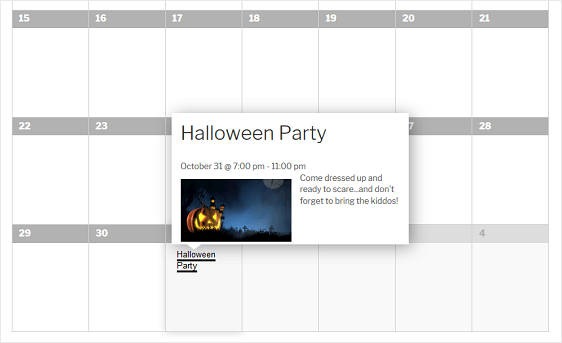 In this article, we’ll show you how to create a user submitted events calendar in WordPress. Why Use an Event Submission Calendar? …and many other types of events for site visitors to see and attend. Allowing your users to submit events instead of adding them all yourself is a great way to engage your audience and save yourself some time. You can even make money online if you charge for event listings posted to your website’s calendar. Let’s take a look at an easy way to allow users to add their events to your site’s calendar. The first thing you’ll need to do is install and activate the WPForms plugin. Here’s a step by step guide on how to install a WordPress plugin. Next, you’ll need to install and activate the Post Submissions addon. To do this, go to WPForms » Addon and find the one labeled Post Submissions. Check out out tutorial on how to create a simple contact form as an example to get started. You can add additional fields by dragging them from the left hand panel to the right hand panel. Then, click on the field to make any changes. You can also click on a form field and drag it to rearrange the order on your user registration form. If you don’t want to customize a simple contact form, you might look into using the Event Planner Form template found in the Form Templates Pack addon. This template comes with many of the form fields your site visitors will need to fill out to submit their event to your calendar. If you decide you want to monetize your website, and charge users to submit their event on your calendar, read this documentation on how to allow users to choose a payment method on your WordPress forms. Next, you’ll need to create a calendar for users to add their events to. For this, you can use The Events Calendar. This is a free plugin for WordPress websites. To do this, go to Plugins » Add New in your WordPress dashboard and search for “The Events Calendar” plugin. The Events Calendar is now ready for you to use. 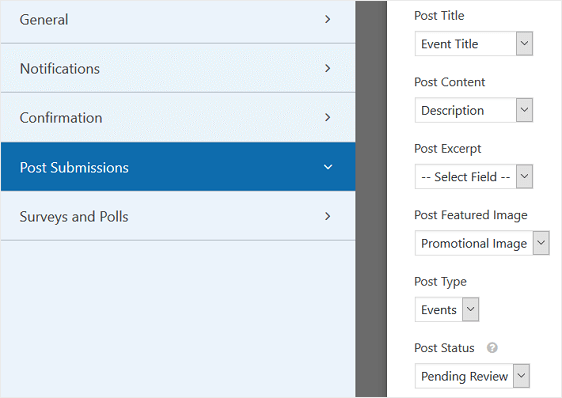 This plugin will create a custom post type called Events that will appear in your WordPress dashboard. Custom post types work the same way that posts and pages work. The Events custom post type will, however, remain separate from your site’s posts and pages. You can preview the calendar that is created after installing and activating the plugin at http://yoursite.com/events. For now, it won’t show much information since you don’t have any events submitted yet. After setting up The Events Calendar plugin, you need to connect the form you’ve created to your calendar. To start, go to Settings » Post Submissions in the form editor and turn post submissions On. Next, you’ll want to match each field to the relevant part of the event custom post type. 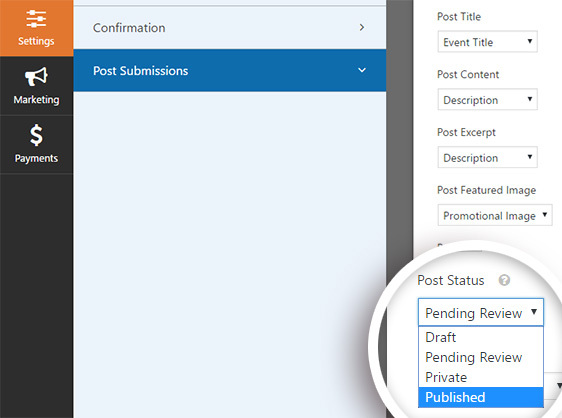 We also set Post Type to Events (the custom post type created by enabling The Events Calendar plugin), and Post Status to Pending Review so that you can approve each submission before it goes live on your site. Now you can scroll down to the Custom Post Meta section. The last part of connecting your form to the calendar is to add just a bit of code here. This will connect the start and end times in your form to the start and end times in the calendar. We’ve shown you the code you need to include in the image below, but you can look up any other custom meta code that The Events Calendar offers if you want to customize your calendar even more. Before you publish your event submission form, it’s a good idea to change the default thank you message users will see. You can do this by going to Settings » Confirmation. In the preview panel, customize your message in any way you like. You can also send users to a designated thank you page or a separate website altogether after they’ve submitted an event to your website’s calendar. For help with these type of form confirmations, check out this helpful documentation on how to set up form confirmations in WordPress. 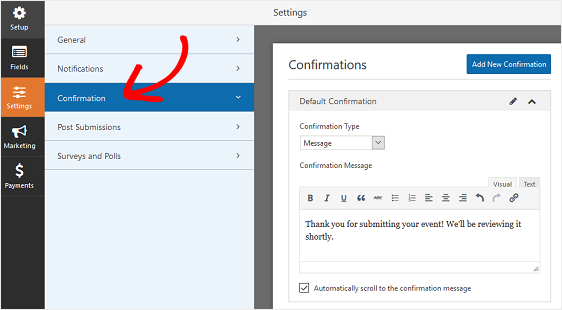 For help with customizing multiple confirmation messages, check out how to create multiple form confirmations in WPForms. Next, select your contact form in the modal popup and click Add Form. Then, publish your post or page so your form will appear on your website and users can begin submitting their events. After your form is live on your site, you just need to approve the events users submit. To do this, go to Events in the WordPress dashboard. You’ll see that any submitted events will be listed as Pending. This means they need to be approved by you before they appear on your site’s calendar. Click Edit underneath the event title. Preview the submission, taking special note of the Time & Date near the bottom of your screen. This will be the time listed on your calendar. When you’re finished reviewing all the event details, click Publish. Then you can view your events calendar at http://yoursite.com/events. When the user hovers their mouse over the calendar event, they’ll see a preview popup. By clicking on it, they’ll get the full event listing. And there you have it! You now know how to create a user submitted events calendar in WordPress using WPForms. Do you want to allow clients to schedule appointments on your work calendar? You might also want to check out our guide on how to create a client booking form. Is there a way for the events to be auto approved, without requiring someone to manually accept them? Also, can the user who submitted the event remove it? Or if they can’t be auto approved, can the website notify you when you have new events awaiting moderation? The event is similar to a blog post (it’s a custom post type), so the user won’t be able to remove/delete it unless they have access to your site as an Editor or Administrator. By default, you’ll always get an email notification when someone fills out your forms. You can customize your notifications or add additional ones (like a confirmation email to the user, for example). I love this post, and I’ve referred back to it a few times. This is so useful. Has anyone setup any other fields in the Custom Post Meta? What about event location, what about event host? or cost? I just saw your link for the Events Calendar custom meta code. Thanks for that! I’m having a problem though with my custom post meta – specifically for the event start and end dates. and doesn’t seem to work. Any ideas on how to get this working? Hey Ryan! We’re so glad you found the post useful! Can you drop an email to support? We’d love to help you troubleshoot this & get your forms working right. Any suggestions on how to do the same thing with front end submissions, but submitting through a payment process like with PayPal? You can absolutely do this along with a PayPal requirement. You would essentially do exactly what is described in this post, then add a cost and payment on top of that. In case it helps, here’s a tutorial on how to set up PayPal in your forms. One thing to note is that since PayPal payments are processed off-site, you’ll need to manually monitor whether those payments were completed before publishing the user-submitted event (whereas with Stripe, the payment must be completed and successful before the form can be submitted). If you have any additional questions about how to get this set up, please feel free to contact us in support! Will this connect to Google Calendar and is there an option to avoid conflict while approving. I notice that you also have an auto approve option which would mean that it qualifies the availability. Thanks. However, this integration can only go one way — events can be sent from your form entries to Google Calendar, but dates and times in your forms can’t be blocked off based on existing events. Will this allow for PDF uploads as well as the image upload? Great question. While our File Upload field will absolutely accept PDFs, there isn’t a great way to automatically send a PDF to an Events Calendar event from a form submission. The issue is that a PDF would need to be added within the main content area, where an event description would generally go. This is also true for regular WordPress pages/posts, since there isn’t a separate field in the editor to add these (whereas a featured image has its own specific spot in the editor). So in order to add PDF to an event, you’d need to manually edit the event listing to add a PDF link. In case it helps, here’s WPBeginner’s tutorial on how to create links to PDFs. I see what you mean. 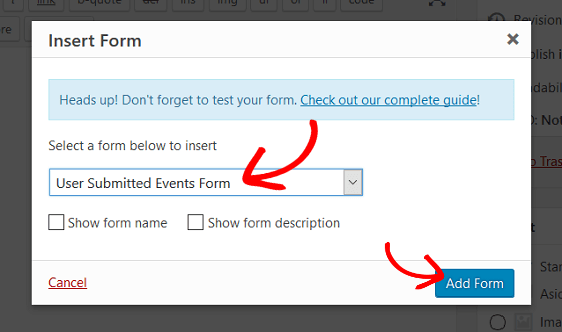 So, if we used this WPForms scenario to add community events to “The Events Calendar” plugin, could we have the user upload a PDF with the submission and then manually attach it on the backend? Or, will it just not work? 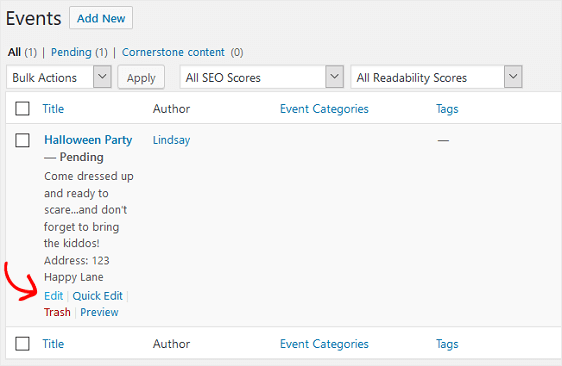 The events editor works pretty much the same as a regular WordPress page/post, so that luckily makes it pretty easy. If you have any other questions, please let us know in support and we’ll be happy to help! I want to have this on my site but I want the events to be from all over the country. A drop down menu to all 50 states and the events to show only in those states. Also the calendar to those states can be accessed by anyone, however to submit an event the user must be registered on the site before they can submit. Imagine having a “submit an event here” button but takes them to the log in page if they are not logged in and then allows access to this form after they are registered. I hope I made this clear enough. Is there a way to do this? For the states part of your question, it would be best to ask the Events Calendar team 🙂 They should be able to provide more details on how this would work/if it’s an option, and if so we could help you connect your form to pass that data along when an event is made. Also, we don’t currently have a way to restrict access to forms, however you could consider using a plugin like Restrict Content (which is free) to achieve this. Hi the events calendar plugin community events which users would use to submit events doesn’t have the ability to let users pay for event listings. Do you know of a way to still use the events calendar and set it up so users can pay to list events? Great question, and I believe this should still work. To be certain, though, I’d recommend reaching out to Modern Tribe to ask if their meta keys are the same for this plugin as for the regular Events Calendar (so the same as above: _EventStartDate, etc). If not, they should be able to let you know the meta keys you’d need to use. Do you know of a simplified way to have all data/fields from each event displayed in an customer interactive/sortable front end spreadsheet style list view. Basically, allowing any customer to sort the events based on all desired visible fields. I.E. sort in list view by date, name, or any other custom fields? I apologize, but this functionality would actually fall to the third-party events plugin your using — such as The Events Calendar plugin described above. In case it helps, here’s the link to their free version support, and here’s the link to their main website’s support page. Based off of this discussion thread I found, it sounds like this type of filter functionality may require a paid addon through them — but their support should be able to clarify that further. I’m wanting to set up a system to allow each user to have their own personal calendar they can add events like people’s birthdays to. This would be private and based on their entries we could send reminders for the events. With links to products we sell as gifts for the events. Is this possible? Will I be able to send email or text notifications to those who sign up (given there is a signup form) for an upcoming event? For instance, we have a Valentine banquet in our church and all who will be attending can be notified of this event one week in advance if they sign up for email or text notification. Our forms can send a notification email immediately after a form is submitted, but the best way to follow up like this is to use an email marketing service. That way, you can add everyone who’s attending an event to a mailing list to easily contact them all at once (and schedule emails in advance) — and if you’re still collecting event registrations, you can automatically add users to your mailing list by integrating it with your forms. We have a bunch of email marketing integrations: Constant Contact, which is available to everyone, and with our Plus license level or higher there’s also MailChimp, AWeber, and more. Hi there I am interested in this integration – would this replace the need for Community Events as far the event submission portion? Also is there a way to include event categories for the user to select on the form? 1) I created the categories I wanted within The Events Calendar plugin (under Events > Event Categories). 2) In the form builder, I added a Dropdown field and named it Category. Then within its Field Options panel, I opened Advanced Options and set Dynamic Choices to Taxonomy, then Dynamic Taxonomy Source to Event Categories (here’s a screenshot of that). 3) In the form builder under Settings > Post Submissions, I added a line of Custom Meta. In the first box I added tribe_events_cat and in the second I selected Category (the name of the Dropdown field I just made). Here’s a screenshot of this. That’s it! When I submitted my form to test this out, my event was successfully assigned a category (here’s a screenshot). I hadn’t had a chance to try that before, so thanks for asking! And if you’d like to collect more event details, you can do that using The Event Calendar’s custom post meta list. Wow Jess – Thank you SO much for checking into that for me! This really looks very promising. Do you know if it is possible to create two separate forms to add events through. For example a logged in user might have access to one version of the form – while a logged out user has access to a different form (maybe with less fields) – but they would both submits events to the calendar. Yes, this should work just fine. The only thing to note is that you’d currently need a separate approach to manage content access based on whether users are logged in. There are a lot of different plugins available for that in WordPress (here’s a popular one called Restrict Content). I was successful to use the Custom Post Meta for date, time, url and the dynamic taxonomy for the event categories but I’m not able to link Venue and Organizer. Should I be using something else? We’d be happy to help! When you get a chance, please drop us a line in support so we can assist. Since it sounds like you have a WPForms license, you have access to our email support, so please submit a support ticket. Right now, I have it looking how I want it to look, but I have to manually add submitted events and format them, which can be time consuming once I move it from dev to live and have users submitting events. Since Events is simply a custom post type, and this setup just changes the user view of posts, it should theoretically work, right? I took a look at the site you shared, but I apologize as I’m not sure I understand how you’d like your forms to work differently/what features you’re looking for. When you get a chance, could you please contact us with some extra details? As I understand from above, that if I use PayPal, I have to manually monitor payments to determine if they are successful then manually post or approve the submitted event. This because PayPal processess the payments off site. What about Square, they are different than PayPal and work similar to Stripe. Would Square allow the submitted event to be automatically posted when the payment is complete, or is that a manual one like PayPal also? We don’t currently have Square integration, but it sounds like our Stripe addon should be a good fit. With Stripe, you’d add a credit card field directly to your form — and so the user won’t be allowed to submit your form until the payment is accepted. Can this Post Submissions Add-on plugin from Wp Forms work with other calendar plugins like Wp Event Manager? Sure, I’d be happy to share more details on this. So essentially, our Post Submissions addon should be able to work in this same way for any plugin that uses a custom post type in WordPress (so sticks to the native WordPress functionality, rather than generating their own datatables). Their support team or plugin author should be able to answer this. Also, some plugins make it a bit easier/harder to find the meta keys you need (like the `_EventStartDate` meta key you see in the tutorial above). Meta keys will be specific to each individual plugin, so I’d suggest also asking their support for these. You’ll need meta keys for any custom field in their post (so any field that doesn’t exist in a normal WordPress post). Is there a way to create recurring events using this? Events Calendar have an option that I can specify if the event repeats daily, monthly… Is it possible to use something like this with User Submitted Posts plugin? I took a look, but unfortunately I wasn’t able to test this out for you as recurring events is a premium option in the Events Calendar. While I believe this will most likely work, it will depend on how they set this recurring option up within their plugin. If you have any questions about how you could test this out, though, please feel welcome to reach out to our team. where exactly do I have to enter something to connect the calendar with the form? 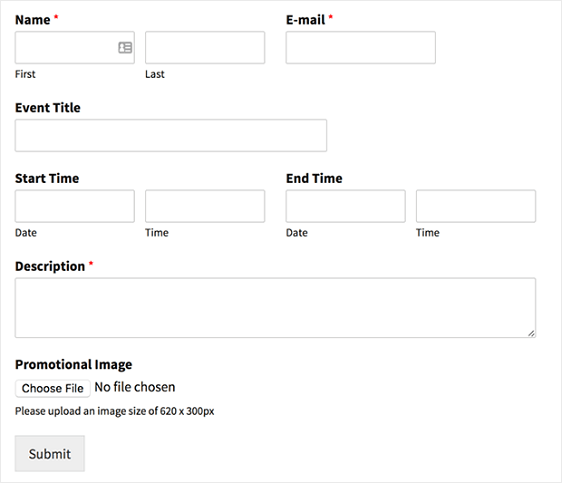 To connect the form and the calendar, you’ll need to go to your form’s settings and go to Settings > Post Submissions, make sure that post submissions are ON and match each field in the form to the event custom post type you created. Next, you’ll need to set up the custom meta code by scrolling down to the bottom of the page. You can follow the example that we included in this screenshot. I saw above someone asked if it was possible to create the form to include the city and state of the event which would then, hopefully, allow site visitors to view events that were upcoming in their cities and states? Is this possible or is this something another group would answer?